Money Idol Exchanger © 1997 Face. Handling money has never been so much fun! This incredibly original puzzle game lets you take control of hilariously designed characters in a cute Japanese superhero theme and boggle your mind with a puzzle system reminiscent of the Magical Drop games but with a tricky-to-master coin handling twist. Good graphics with lots of funny animations (the intro is indeed a joy to behold! ), cool pop music & lots of challenge make this game a true gem to behold! 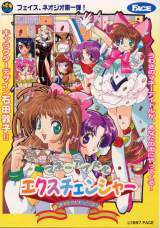 Money Idol Exchanger was released in January 1997 in Japan. It's Face's last video game. This game is known outside Japan as Money Puzzle Exchanger. 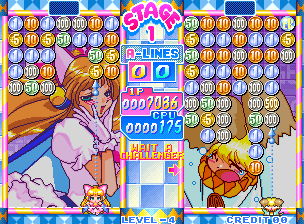 This game runs on the Neo-Geo MVS and was never released on the Neo-Geo AES home console. The coins in the USA & European versions are generic looking coins featuring values of 1, 5, 10, 50, 100 & 500. In the Japanese version, the cents are localized just like those seen on 'Moujya'. Pony Canyon / Scitron released a limited-edition soundtrack album for this game (Money Idol Exchanger - PCCB-00260) on 16/05/1997.